The Nike Kyrie 4 City Guardians made its early debut at Boston Sneakeasy before becoming widely available in January. 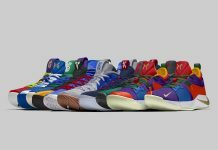 Part of the Nike Basketball City Guardians Collection. This Nike Kyrie 4 pays homage to Kyrie Irving’s new home in Boston. Dressed in a Silver, Metallic Gold, Light Gum Brown and Gold color scheme. Featuring a Matte Silver upper with woodgrain print on the quarter heel. Metallic Gold accents are seen the logos, while Celtics Green covers the outsoles. Look for the Nike Kyrie 4 “City Guardians” to release on January 24th at select Nike Basketball retailers. The retail price tag is set at $120 USD. You can already find pairs available via eBay. UPDATE: Product photos of the “City Guardians” Nike Kyrie 4.